In nearly every classroom there are a number of students who do not have the reading level needed to comprehend written content-based material. One of the biggest challenges teachers face is providing text for struggling readers. Technology is a tool that can help. Here are some tools for providing students with the support they need to succeed. Many thanks to Sheri Lenzo, assistive technology expert, for teaching me all of this and much more. This free software needs to be installed on your PC. After that, just highlight the text you want read aloud and click on Control + F9. Voila! Install a handy bookmarklet and watch this tool scrub web pages of distractions by removing the ads and creating a more readable body of text. Macintosh computers have the text to speech feature built in, but it needs to be activated in System Preferences. Watch the tutorial on this wiki. A search engine that yields color-coded results by readability in order to provide users with text written at appropriate levels. View more simple search engine tools on my wiki. One of the languages supported by Wikipedia is “Simple English”. 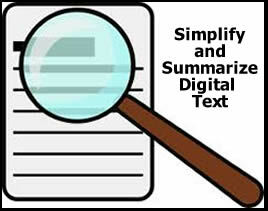 Choose it to find information written using simpler words and simple sentences, which lowers the readability level.